Troublewithtribbles reports the first span of the new Frances Appleton pedestrian bridge across Storrow Drive from Beacon Hill to the Esplanade went up overnight. Read more. Liz Covart reports nobody seemed injured, at least, in this crash on Storrow Drive outbound shortly after 6 a.m.
State Police report arresting a Medford man on OUI charges after he allegedly rammed into a cruiser stopped on Storrow Drive, setting off a chain reaction that also damaged a second cruiser and sent a man to the hospital. Read more. Rick Schimpf paid his regards to the bus whose driver rather suddenly discovered was somewhat taller than 11 feet, shortly before 11 a.m. on Storrow Drive inbound by the BU exit. Patrick McMahon looked out over the Charles this morning and didn't see much. Other people looked out and up, too: Read more. Lisa Jacobson captured this near miss on the inbound side of Storrow Drive this afternoon. The tire-eating pothole is inbound just past the Kenmore ramp, so might be time to seek one of those alternate routes. If only that bridge were 12'1" instead of just 12', he might have made it. Instead the driver of this storrowed box truck now has to explain to the state troopers why he ignored the CARS ONLY signs, in a classic Storrow Drive tableau captured by Raymond the roving UHub photographer at 9:06 this morning. 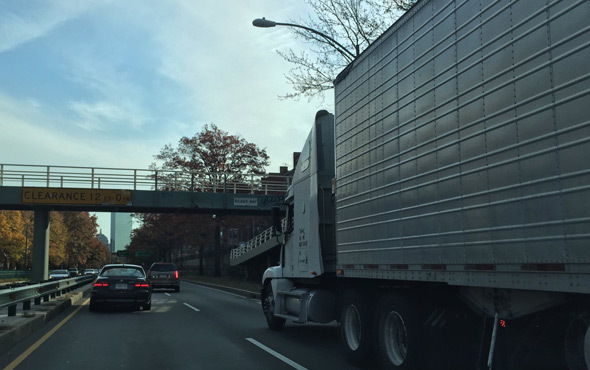 Kara Sassone found yet another truck driver astute enough to not plow into a bridge after ignoring the CARS ONLY sign on Storrow Drive this morning.